Seven original one-acts ranging from scripted realism living room drama to devised dance distillation of one person’s life. I performed in two of the one acts. Nesting Dolls - A clowning performance addressing the nature of choice and and hope amongst the oft-overlooked members of society: the homeless. Vows - A scripted dramedy wherein a new couple - an Episcopal pastor and a atheist - getting ready in the morning discuss faith, love, and the future of their relationship. "...Matthew M. Collie is charming as a mystical man in a jester’s hat..."
"Anna Murray and Matthew M. Collie’s charisma and chemistry go a really long way here ... Murray and Collie bring that compelling interaction to the stage with a very organic feeling of emotion and human connection." 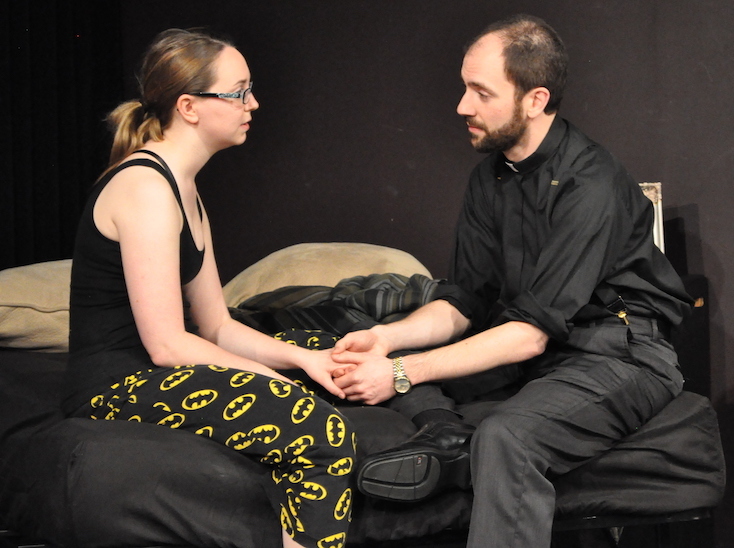 "...genuine chemistry and charisma between actors Anna Murray and Matthew M. Collie." Matthew M. Collie is making his Cooperative Performance Milwaukee debut. A recent transplant to Milwaukee, Matthew’s local credits include Miles (She Kills Monsters) at Village Playhouse and Father/Bob Bradley (The Best Christmas Pageant Ever) at Sunset Playhouse. Other credits: Lorenzo (The Sweet New), Shag (Equivocation), The Oil Project, Anton Schindler (33 Variations), and Dr. Jason Posner (wit) with Theater B of Fargo, North Dakota; and Basil Bennett (The Diviners) with Fargo-Moorhead Community Theater. Matthew is a member of the National Forensic Association Hall of Fame. Production photos were taken by the eminently professional and excellently named Matthew D. Konkel. If you enjoy the work please support Matthew. Vows: I'm going to church. Vows: Will we be okay?